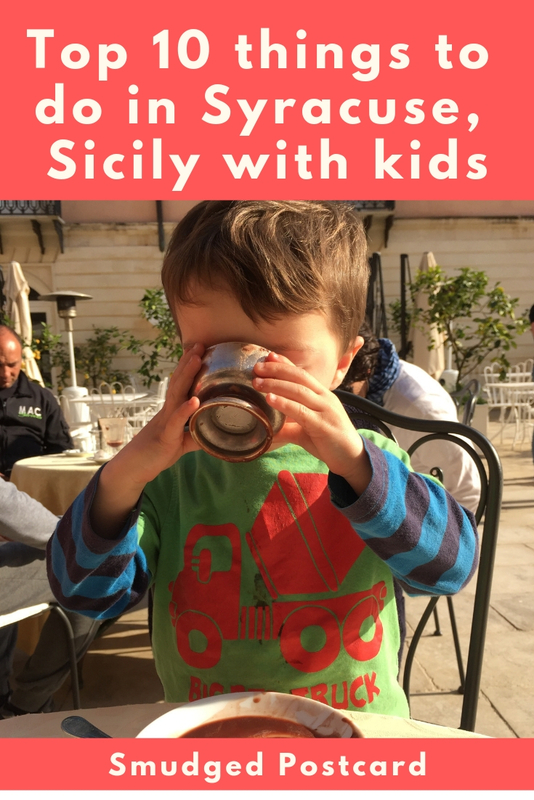 Syracuse, on the east coast of Sicily, is ideal for a city break, with or without kids. 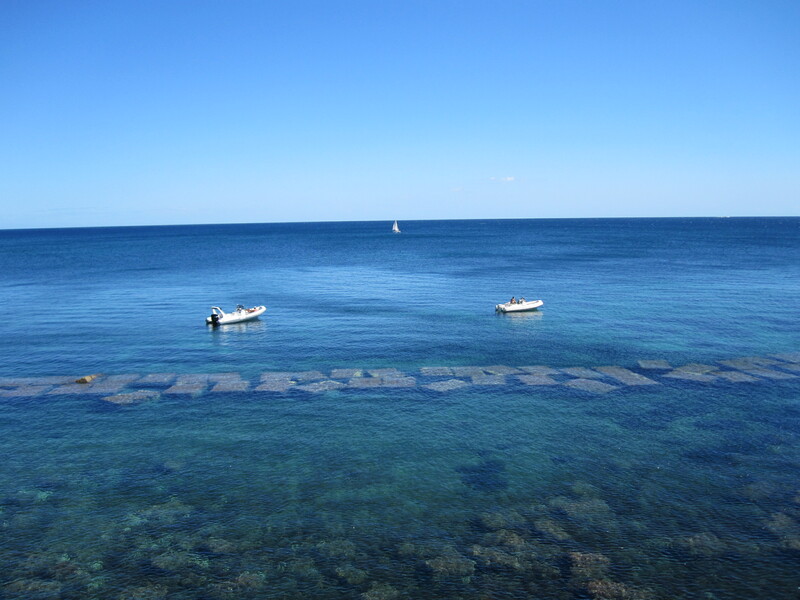 It’s just an hour’s drive south of Catania airport and can be visited for a long weekend or as part of a bigger trip around Sicily. 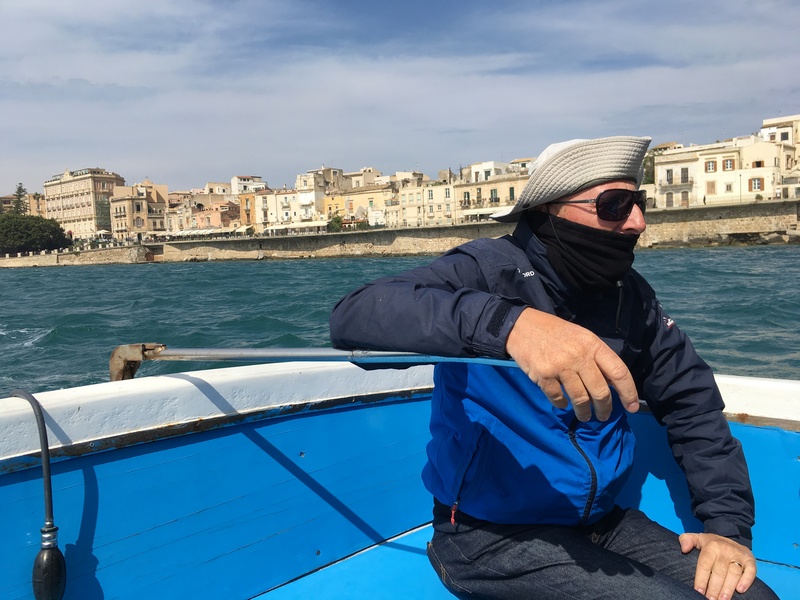 Its historical heart is the island of Ortigia, just one kilometre square, where you’re never far from a glorious sea view, or an enticing restaurant or gelateria. 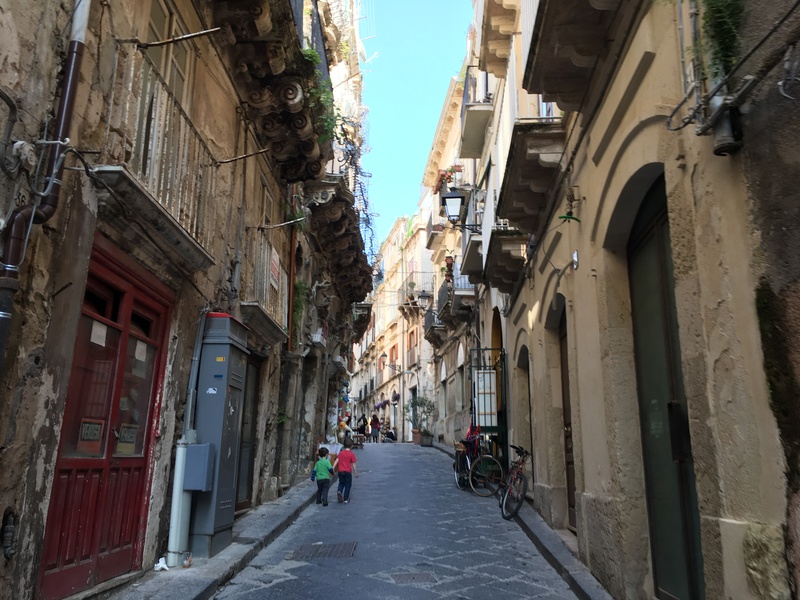 This being Sicily, there are ancient ruins aplenty, car-free piazzas, majestic Baroque architecture and lots of fun diversions for children of all ages. 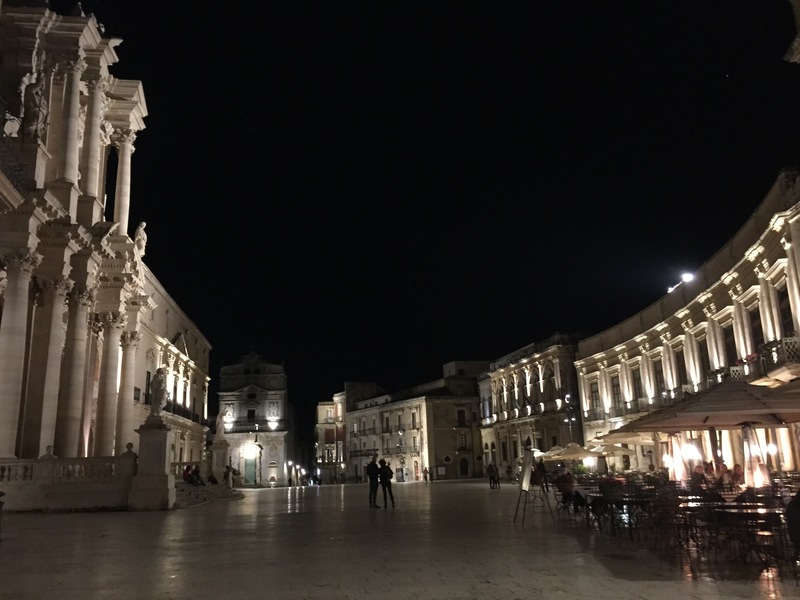 We visited Syracuse with our children in April for two nights while in Sicily (read more here) and it was without doubt one of the highlights of our trip. The city is flat and many of the streets are car free so it’s perfect for idle wandering rather than guidebook-led marching. 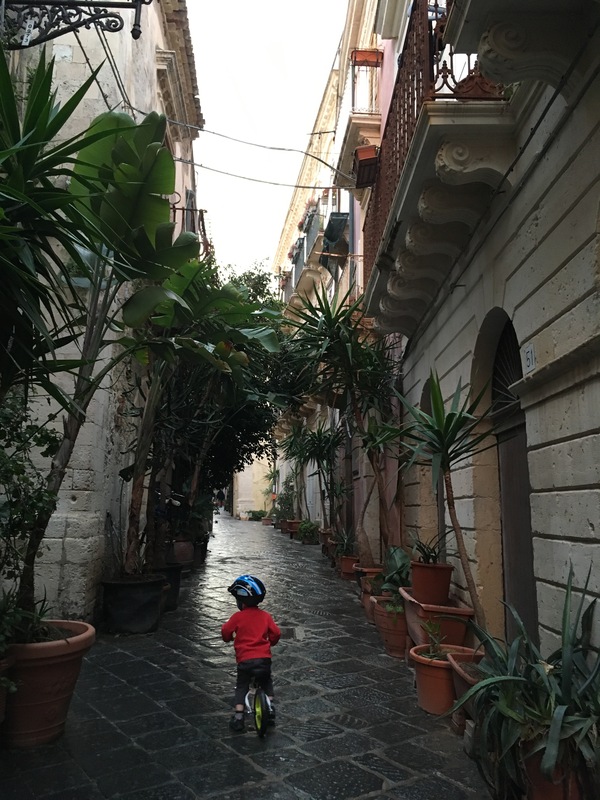 Our boys (aged 5 and 3) were on balance bikes, so they had great fun zooming along the alleyways pretending they were on mopeds (said mopeds greatly improved their road safety awareness). You can easily wile away an hour or two exploring; there are great little shops, amazing looking eateries and delightful piazzas to discover. We stopped regularly for coffees, ice creams, lunch, granita, aperitivos, dinner… there always seemed to be a valid reason. 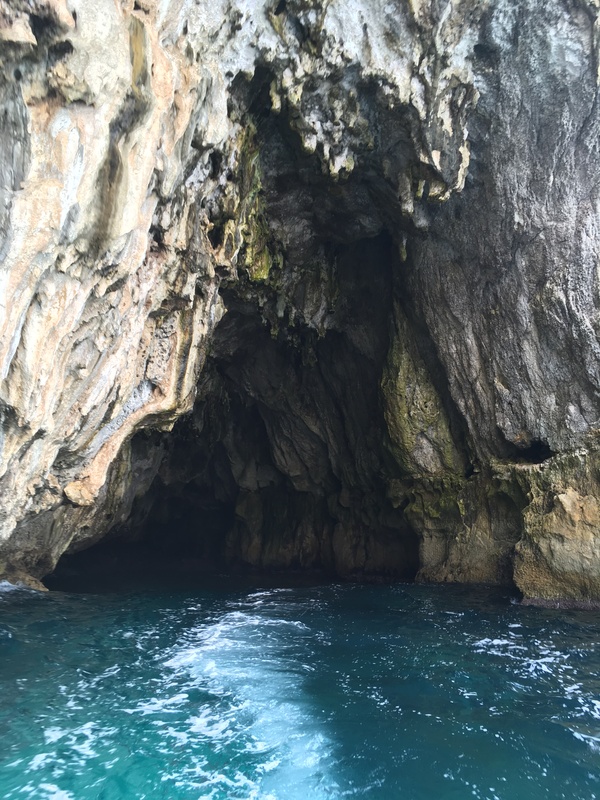 If your children tire of wandering (although the town is small enough that they shouldn’t), hop on a boat and tour Ortigia and its nearby caves from the water. The trip includes moving under a very low “mind your head” bridge at the end! 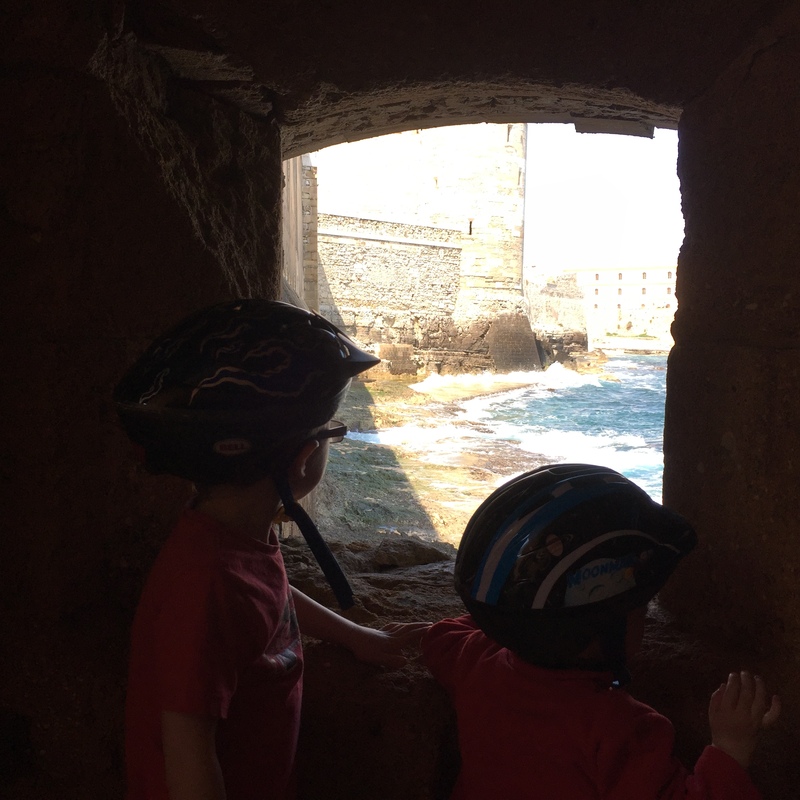 Set at the very tip of Ortigia with the waves lapping its ramparts, 13th century Castello Maniace is the perfect place for kids to let their imaginations run wild. There are towers, a large keep, pathways, tunnels and underground rooms with windows overlooking the sea. The plots are generally so convoluted you’d likely not follow them in English so don’t worry that these 45 minute productions are in Italian, go for the epic sword fights and brilliant monsters. Seats in the first two rows are reserved for children and at the end of the show the puppeteers come out to take a bow and show off their puppets. There’s a programme with an English translation including a list of the characters so you can brief the kids on what they’re about to witness. As well as the theatre, there’s also a museum and a workshop to peek into. 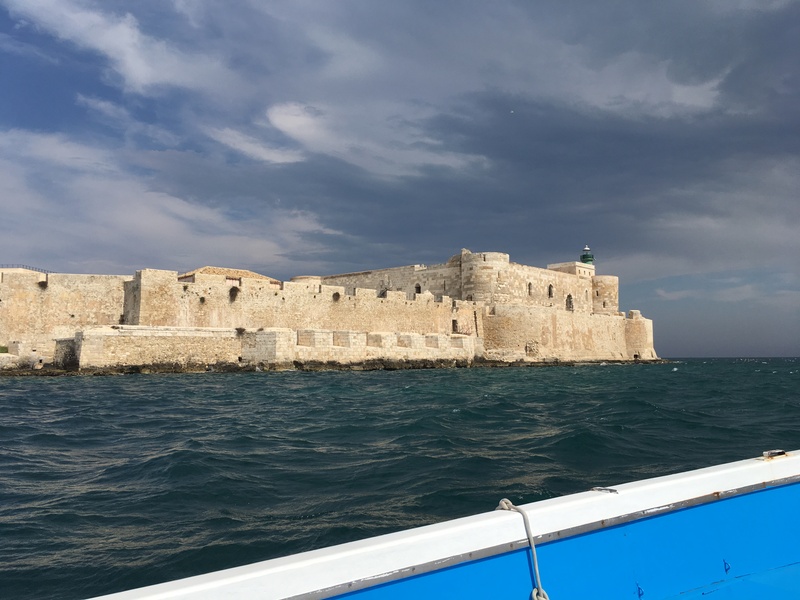 There are rocks to swim from on Ortigia at Forte Vigliena but if you’d prefer something sandy, there are countless beaches a short drive or taxi ride away. Ancient Greek and Roman history might not appeal to all children but the archaeological site just outside Syracuse (2km) offers more than just a couple of 2,000 year old amphitheatres. 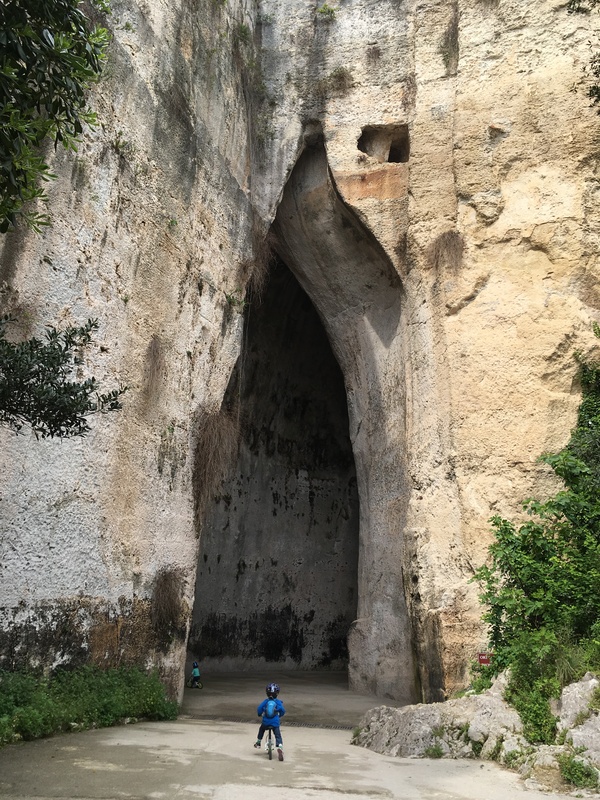 Here, you can walk into a giant manmade cave nicknamed the Ear of Dionysus. Legend has it that prisoners were once held here and the emperor could listen to their wails due to the impressive acoustics of the cave. Our kids loved the powerful echoes and the sheer size of the cave. 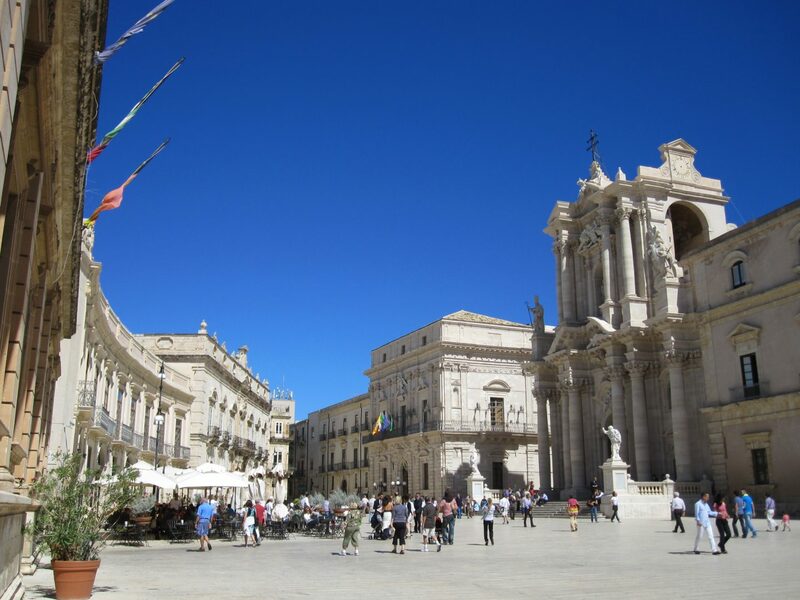 My favourite piazza in Sicily has to be Syracuse’s Piazza Duomo. Its limestone palazzos appear to glow in the sunshine and it’s a great spot to let the kids run around. 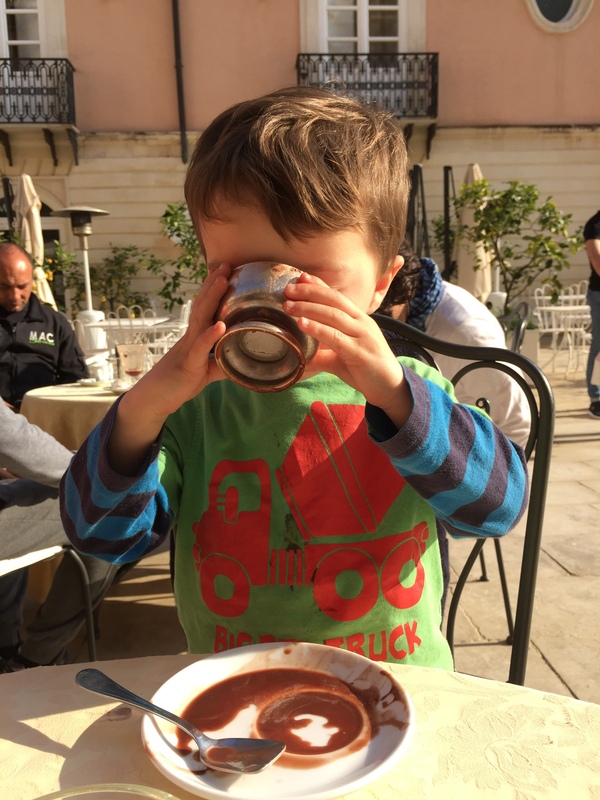 We drank coffee while our kids ate ice cream and then played with other children. The cathedral is almost a complete history of Sicily with Greek, Roman, Arabic, Norman and Baroque elements. Such is the draw of simply sitting in a piazza, ice cream or coffee in hand, watching the world go by, that we didn’t manage to visit the Ipogeo. 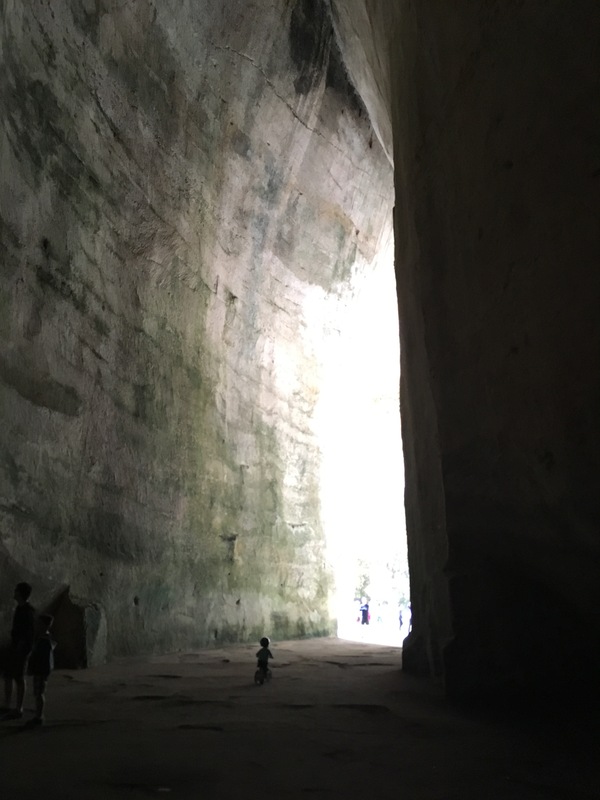 However, it sounds intriguing: a series of Roman cave-like passageways under the city, used as an air raid shelter in the Second World War, which lead from Piazza Duomo to the sea. If anyone has visited them, please let me know what you thought. 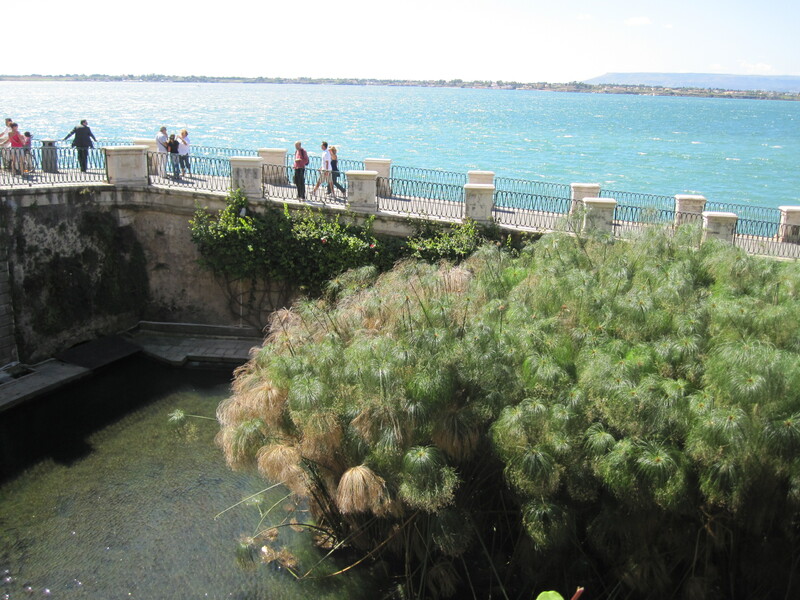 If you want to find out whether that fish you had for dinner really does frequent the waters around Syracuse, visit the little aquarium on the western seafront. Barring the ice creams, all of the above attractions are free to children. So much to see and do! Those puppet shows look delightful. The puppet show was hilarious! I’m now trying to find a Punch and Judy show for my kids to see in the UK! I can’t wait to return with my boys, I’d like to visit some of the islands next or maybe the north coast and mountains. Tricky decisions! Syracuse looks as though it has the perfect mixture of relaxation and culture. I know my two kids would love shouting inside the ‘ear’ to make echos – and wow, that beach! I agree, cities by the sea are particularly appealing! I’d love to visit Syracuse some day. There seems to be a lot to see and do there. #TheWeeklyPostcard. Oooh pretty! I’ve never heard of this Italian city before! Thanks for introducing me!! Will be pinning this! Thanks for linking up with #TheWeeklyPostcard! 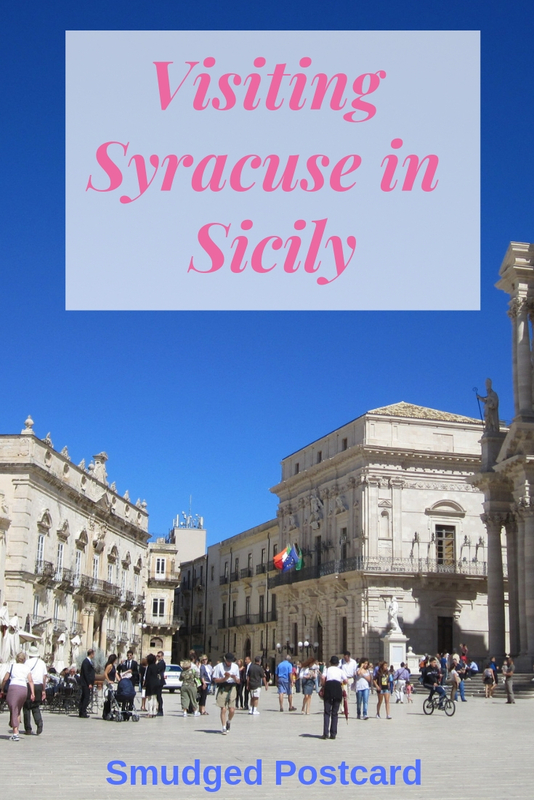 I really want to make it to Sicily at some point, so adding Syracuse to my list. Thanks for sharing on #TheWeeklyPostcard. Looks amazing! Love all things Italian. Thanks for the great roundup of a city that wasn’t on my radar. The town really has something for everyone food, culture and fun. We bought bikes when we got there, fantastic investment. They rode round all the historical sites perfectly happily! Haha, yes I probably should have specified in the title! Wonderful website. Plenty of helpful information here. I’m sending it to some buddies ans also sharing in delicious. And certainly, thanks on your effort! Fantastic recs! We are here for 2 months with 4 kids, all under 5 years old. 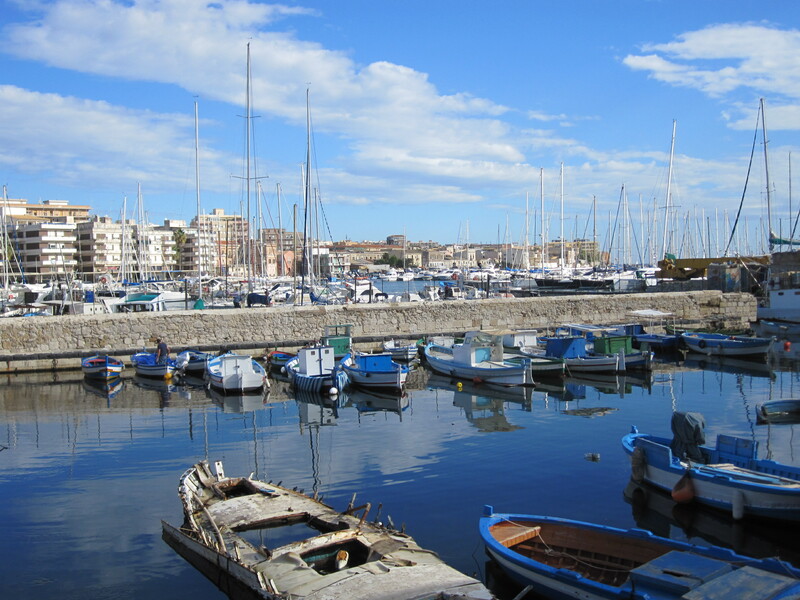 We have rented a flat in the heart of Ortigia, and your information is beyond helpful! Thank you!! Wow, lucky you! Hope you have a brilliant time! Hi, I like the Syracuse from your personal point of view. I also spent almost a week with my family there and we visited Puppet theatre. 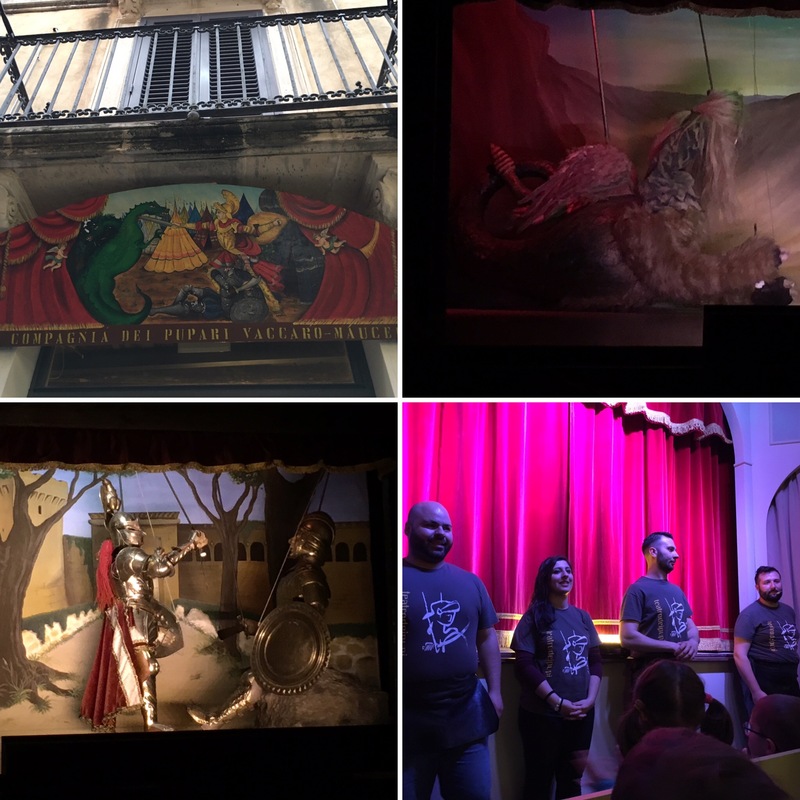 I liked puppets and atmosphere in theatre, so unique and rustical, but I can not say that I liked performance, to much violence and sword fights, even we didn’t understand italian it was obvious that appearance of devil and dragons is not child friendly plot. What do you think? Well, my boys laughed at the violence, they didn’t take it very seriously at all. I guess the action appeals more to small children than it does to adults, it certainly helped with the lack of Italian comprehension. I’ll have a read of your review, thanks.